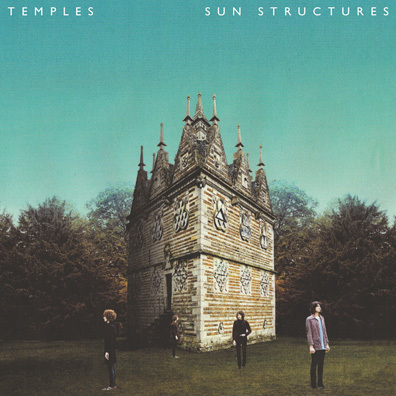 Dig out your suede jacket and dust off your Beatle boots: Temples and their debut album Sun Structures are dragging the jingly-jangly psychedelic pop sound into 2014, and you need to hear it. There have been a whole host of spaced-out psych acts crawling out of the woodwork since Tame Impala showed everyone that swirling five-minute slowjams don't have to be the kind of self-indulgent prog knobbery that most people associate with psychedelia; of all of them, Temples have one of the purer and poppier approaches to that original '60s and '70s sound. Whereas bands like TOY and Younghusband have mixed their psychedelic leanings with more experimental drone elements of Krautrock and shoegaze, Temples seem to have decided that if it ain't broke, there's no point in fixing it. Sun Structures is such a self-assured debut LP that it's hard to believe that the band, hailing from a small town in the English Midlands, only formed in mid-2012, with their stunning first single "Shelter Song" released a few months later. That same single opens the album, its lemon-sharp guitar riff, call-and-response vocals and tub-thumping drums a great attention-grabber for the unconverted. "Take me away to the twilight zone" sings curly-headed frontman James Bagshawe, inviting you into Temples' kaleidoscopic world in a voice reminiscent of Robert Plant in his more subdued moments. It's an unexpectedly muscular record, with a forcefulness which the four singles that preceded it—"Shelter Song," "Keep in the Dark," "Mesmerise," and "Colours to Life"—perhaps wouldn't have suggested. Bands like The Beatles and The Byrds are frequently used as touchstones in describing Temples' music, but there's a subtle early '70s hard-rock current rearing its head throughout Sun Structures, too, going beyond Bagshawe's vocal resemblance to Led Zeppelin frontman Plant. The band's Byrdsian jangliness—all bright, diamond-hard guitars, entrancing vocal harmonies, and shuddering organ drones—is beefed up with thunderous Bonham-worthy drumming and peppered with cavernous, fuzzy blues riffs, rendering them more than just a bunch of Carnaby Street nostalgists.